I have been watching the events unfold in Japan. It is truly astounding the power of Mother Nature. While several US networks seem to be tempering their coverage of the nuclear fuel melt, and yes, there are multiple reactor fuel melts in progress, other sources are forthright. The BBC seems to be on top of things, as well as Russia Today. No fewer than four hydrogen explosions have taken place in all four reactors at the Fukushima-1 Power plant. The after the third explosion yesterday in unit 2, there are two major concerns; breach of the reactor vessel(s) and run away nuclear fission. After that explosion, the pressure in the unit 2 reactor suppression chamber dropped from three atmospheres to one atmosphere, indicating the suppression ring had breached. Currently the nuclear disaster is categorized as a 6/7, surpassing Three Mile Island. The worst case scenario: Reactor Unit #2 completely breaches, this unit contains Mox fuel Note: unit #3 contains the Mox fuel. (mixed plutonium/uranium oxide), which is far more dangerous than the fuels in the other reactor vessels. Mox fuel has a lower melting point and could potentially melt into a pool at the bottom of the reactor vessel resuming fission. Criticality? Yes, but not the high order type as seen in a nuclear weapon. The root cause of the disaster is loss of cooling after the reactors where shut down. The nuclear fuel cores require cooling for at least two to four weeks after shutdown. The backup diesel generators went off line approximately one hour after the units were automatically shut down during the earth quake. Three probable causes for this have been proposed; the electrical switch gear for the generators was in the basement of the generator building, which was flooded by the tsunami, fuel contamination/fuel loss, and submergence of the GENSETs by sea water. All of three of these scenarios points to a design flaw. Radiation levels have varied but are elevated, peaking at various times before and after each explosion. Until this morning, the major radiation plumes were being blown off shore. The wind has become variable, causing the down wind zones to shift. Prevailing east winds could blow some of the contamination to the west coast of the US within 36-48 hours, east coast by 48-72 hours and in 7-10 days there will likely be a band of radioactive particles in the jet stream that circles the globe in the northern high latitudes. But not to worry, everything is okay. There will be no detrimental effects of this, whatsoever. Regardless, I have headed down to the basement and dug up my CD V-700 RAD meter. I salvaged this from the dumpster at WPTR after one of the contract engineers threw it away in the early 1990’s. 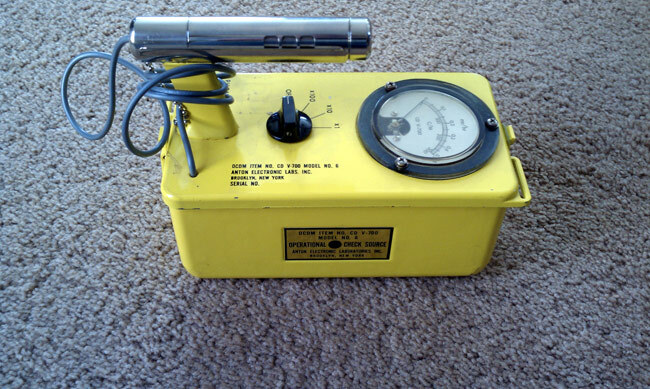 I believe I used this meter to measure the radiation from the tubes in the BT-25A and the MW50B transmitters. According to the “Operational Check Source” on the side of the meter, it still works and is pretty close to calibration level. Even if it is not totally accurate, it will still indicated an increase of radiation. This is a Anton Model 6, which is the most sensitive of the V-700 series meters. It can be used to check background radiation levels and/or contamination of food or clothing. The best plan is not to ingest radioactive particles in food and water. Why wonder about it, when you can know?